Lock in a great price for Holiday Inn Express Hotel & Suites Limon I-70/Exit 359 – rated 8.9 by recent guests! I liked that it was comfortable, quite, the staff was great, and we really enjoyed it. Ease of getting in and out since we had a 20 ft uhaul truck and trailer! Fantastic room for the price. Good breakfast, as usual. The indoor pool was larger than most indoor pools, and the hot tub was nice too. The pool opened at 5:30, so I could take an early morning swim. Nice staff, comfortable room, good choices for breakfast. Very nice hotel for 1 night stay before hitting the road again. Right off of US 70. It was quiet , clean and staff was very accommodating. Parking lot was a bit tight as hotel was busy. Breakfast we well presented and very typical of the chain . Quick, friendly check in. They accommodated a bunch of blizzard-stranded guests with courtesy and speed. Awesome breakfast. Comfy beds. Nice new property. Very friendly and helpful staff. Room was clean. Holiday Inn Express Hotel & Suites Limon I-70/Exit 359 This rating is a reflection of how the property compares to the industry standard when it comes to price, facilities and services available. It's based on a self-evaluation by the property. Use this rating to help choose your stay! This hotel is located just off Interstate 70, in historic Limon, Colorado. It serves a hot breakfast every morning and features an indoor pool, hot tub, and modern fitness center. Rooms at Holiday Inn Express Hotel & Suites Limon I-70/Exit 359 have sleek, modern furnishings and free Wi-Fi. 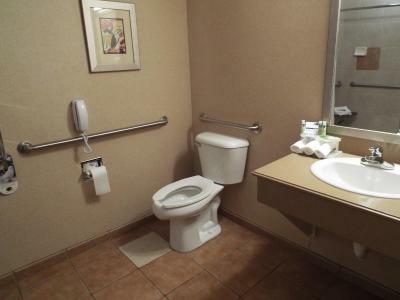 They come equipped with helpful amenities like a coffee maker and a hairdryer. This completely smoke-free hotel offers a well-equipped business center and on-site coin laundry. The front desk is staffed 24 hours a day. The Limon Holiday Inn Express Hotel & Suites is 2 miles from the Limon Country Club. The Limon Heritage Museum is just a mile away. This property also has one of the top-rated locations in Limon! Guests are happier about it compared to other properties in the area. This property is also rated for the best value in Limon! Guests are getting more for their money when compared to other properties in this city. When would you like to stay at Holiday Inn Express Hotel & Suites Limon I-70/Exit 359? Free Wi-Fi, a cable TV, coffee-making facilities and a hairdryer are included in this room. Suite includes sofa, dining area, microwave, and refrigerator. House Rules Holiday Inn Express Hotel & Suites Limon I-70/Exit 359 takes special requests – add in the next step! Holiday Inn Express Hotel &amp; Suites Limon I-70&#47;Exit 359 accepts these cards and reserves the right to temporarily hold an amount prior to arrival. Holiday Inn Express Hotel & Suites Limon I-70/Exit 359 accepts these cards and reserves the right to temporarily hold an amount prior to arrival. Its not what I didnt like, its there is/was nothing to not like about the stay. Clean and spacious room. Great full breakfast bar. I had to wait at the desk at check-in because several families traveling together were all checking in at the same time. Only one entrance to the property at the side of the motel entrance. Signage difficult to see from driver’s view if driving solo. Can hear people next door pretty easily.